Church members and local builder, Ernie Moon, constructed the Quaker Honey Creek Friends' Meeting House in 1916. 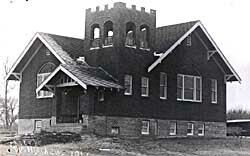 Roy and Bert Wilson, with Moon's advice and much help from church members, laid the first brick and constructed the building. The meeting house is constructed of clay tile, with exterior walls veneered in brick. The main gable is oriented north-south, with an intersecting front gable on the east side. A smaller gable is set asymmetrically at the outer corner of the north and east gable ends. The latter small gable, supported on square brick piers, shelters the main entrance. Behind it rises a short square bell tower with crenellated parapet and pairs of elliptical arched openings on each side of the bell chamber. The small gable on the north side covers a secondary entrance and vestibule. The meeting room or sanctuary is illuminated on north, south and east by large segmental arched openings housing a multi-light transom, below which is a tripartite grouping of two nine-over-one double hung sash windows flanking a central 15-over-one double hung sash window. All other window openings are simply rectilinear. The main entrance consists of a pair of paneled doors, each topped with a semi-circular light. It opens into a vestibule and stairhall (the sanctuary is a few steps above the level of the entrance) that in turn leads into the meeting room proper. This room occupies most of the main floor area. The Honey Creek Monthly Meeting was first organized in 1852, by a group of Friends originally from Yadkin County, North Carolina. They arrived in Hardin County in 1851. The first meeting house was a log building, erected in 1854. It was replaced, after a fire in 1859, with a 32 by 48 foot building that, with various subsequent additions, was used until 1916. Although there are no longer regular services held at the Honey Creek Meeting House there are several events that still take place within the building. The Honey Creek Preservation Group meets regularly to make decisions regarding maintenance and sponsoring annual events. The Honey Creek Meeting House also possesses a wealth of historical information that has been catalogued and filed for access to interested parties. This information includes genealogical records, personal histories, letters, church statistical records, books by local authors, and other items. 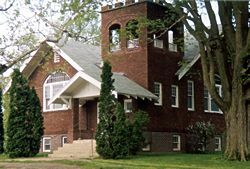 The Honey Creek Meeting House is located at 31031 PP Ave., two miles south and a half miles west of New Providence, Iowa. It is not regularly open to the public, but for further information on special events or to reserve the facility call Judy Staples at 641-497-5799; Dee Reece at 641-497-5499; Paul and Alice Williams at 641-497-5391; or Vera Cutler at 641-497-5458.